Loja Wildlife, Granada Province, Spain. : A visit to friends near Grazalema, Cadiz Province. A visit to friends near Grazalema, Cadiz Province. A wonderful couple of days (Day 2). 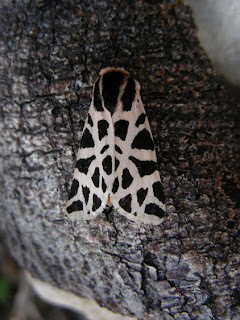 The first task of the morning was to sort out the Moth trap which we had set up the previous evening. 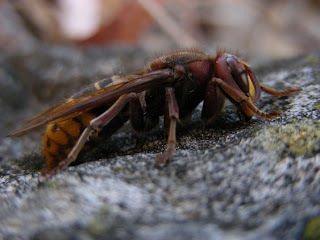 The first obvious problem was a number of Hornets (Vespa crabro) had been attracted into the light along with the many moths. Luckily they were all pretty dosile and did not take much sorting out, Clive fished them out with a stick and placed them in some vegitation. The moths included Egyptian Bollworm (Earias insulana), Cymbalophora pudica, Menophora japygiaria, The Four-spotted (Tyta luctuosa), The Vestal (Rhodometra sacraria), Small Mottled Willows (Spodoptera exigua), Palpita unionalis-vitrealis, Small Blood-vein (Scopula imitaria) and many more. 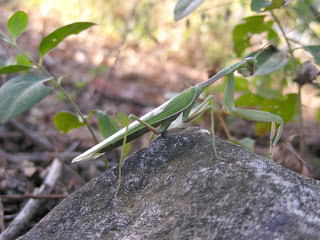 Also attracted to the the light and found in a bush to the side was an African Mantis (Sphodromantis viridis) easily Identified by the pale spot on the wing and by a run of yellow lines on the upper leg. We then had breakfast and relaxed around the garden table again. Jayne had a good wonder around Clive's veg patch and picked his brains about several plants and I walked up and down the drive way pushing Sam in his pushchair tryi ng to get this highly alert young chap to sleep. On the many trips I picked up another Western Spectre (Boyeria irene), Great Spotted Woodpecker (Pico Picapinos / Dendrocopos major), Robin (Petirrrojo / Erithacus rubecola) and several large groups of Griffon Vultures (Bultre Leonado / Gyps fulvus). 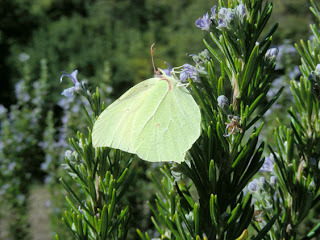 A Brimstone Butterfly (Gonepteryx rhamni) then gave me the run around on the large Rosemary bushes that are next to the house but I eventually got a couple of shots. We then sat down at the table for lunch and whilst we were there a male Hawfinch (Picogordo / Coccotraustes coccotraustes) sat out in a dead tree for a while and then dived for cover. After lunch we loaded the car with a pool liner, several plants and a load of Clive and Sue's home grown garden produce (thank you), said our goodbyes and headed off home. Photographs from the top: Hornet (Vespa crabro), Cymbalophora pudica, African Mantis (Sphodromantis viridis) and Brimstone (Gonepteryx rhamni). Hi Sue, Clive and Sam. Yes the squashes have been roasted, Souped and eaten via various other methods and all were very good, still have four left but they look so good on the shelf that it's a shame to eat them. Thanks Mick.